This is an off-topic post for TacO, but I'm proud of the accomplishment and it also gives you guys some insight into why sometimes there's no update for TacO for a while. Besides playing GW2 on and off and developing the overlay for fun, I have a big chunk of my free time allocated to a hobby known as the Demoscene. Every Easter there's a huge event taking place in Germany that me and my demogroup called Conspiracy do a lot to prepare for. We participate in a category named 64k intro, which means that we create audiovisual presentations that run in real-time from a single executable (no additional data or files allowed for anything) that can be no more than 65536 bytes large. This program, when run, generates music and visuals in real-time, just like a game engine does, the difference is, that here the displayed content is also completely procedural. So. We went to Revision this past weekend, and are very proud to have not only won the 1st prize in the 64k intro competition, but we were also awarded the Crowd Favorite prize, which was selected from all the entries in all the competitions by the attendees. So, without further ado, here's a video of our production. There's a link to the actual executable in the description, but at this point many antivirus programs will probably mark it as a false positive (just like it happens a lot with new TacO releases), so I don't blame you if you're a bit paranoid and stick with watching the video. Yesterday's build had a memleak in it that has been causing crashes and performance issues with trails. This update should hopefully fix it. You can download the new build here. This update doesn't bring any new functionalities, but instead focuses on making it much easier to distribute and install marker packs. First off: marker packs can now be distributed as zip files as well. Any zip file inside the POIs folder next to TacO will be parsed, and all xml files inside there will be imported as markers. This should help out a lot for those of you who don't really like messing around decompressing downloaded stuff. There's a very interesting thing in windows where it's possible to register an application to handle its own protocol, similar to how file extensions can be assigned a default application. This means that when you click on a non-standard link in your browser, it'll look up the appropriate application and ask you if you want the link opened in that application. Steam uses this mechanic to start games when you click on them in the browser, and now TacO can do something similar too: the overlay now supports one click, on-the-fly installation of marker packs straight from a browser, just by following a link. Of course you first need to download and run the new build in order for the protocol to be registered. In short: tab out of GW2, go to a website, click a link, tab back to the game and enjoy the markers. Important: you need to run the new build of TacO once before the links will start to work. So here's the technical stuff: any website hosting markers can now also link to them using the gw2taco://markerpack/* formula, where the * part should be the actual download URL of the zipped up marker pack without the http:// part (TacO will try to download the zip file through http, and https if that fails). this will tell TacO to download the http://www.somewebsite.com/subfolder/markerpack.zip file, save it to the POIs folder and load it as a marker pack. Some tests are performed to make sure that the file is actually a zip and that it can be loaded before storing it in the POIs folder. GW2 TacO will no longer be fooled by other windows called "Guild Wars 2"
Added "toggleCategory" attribute to markers. These markers will toggle the specified category on or off when triggered with the action key. I saw an uptake in the number of posts about TacO on the main GW2 subreddit lately, and decided to level up my internetz skills slightly to set up a discussion board where people can share their marker packs and maybe band together to create a map completion pack (and more interesting things later...). 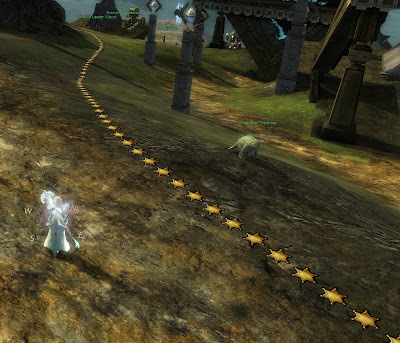 So I give you: the Guild Wars 2 Tactical Overlay subreddit! Sorry for the lack of updates lately, real life chaos prevented me from having the energy or the time to work on TacO since August. In the meantime, Tekkit's marker packs have become quite popular and a regular source of helpful information (I myself used his pack for the daily Wintersday orphan runs). He does, however, tend to stretch the limits of the system with how many markers his trails require. There are less resource intensive ways of doing what he does, not to mention the time and effort it must take to place all of these markers. In order to make his job easier, I created a new feature that should also be more resource friendly. Trails are continuous lines on the terrain that have a custom scrolling texture animating over them. Other than this in many respects they function just like markers with the same enabling-disabling controls, etc. The main difference is the way they are created: by recording the movement of whoever wants to record a trail. As trails contain a lot more data, they are stored in an optimal binary format, which makes it harder to edit them by hand, so (for now) rudimentary recording tools have been added to the overlay as well. The documentation has been updated to show how to use and share trails. Note: this build is only a feature enabler build, and as such doesn't contain any recorded trails yet. It's been a while, but development hasn't stopped. I recently joined the GW2 API dev chat and some things have already come of it. Namely, a new small but powerful addition to the Mumble API now allows TacO to track the client's interface size setting in real-time. Many people were confused about the separate interface size setting in TacO (or didn't even know about it), and I wanted to refrain from implementing more features that rely on correct positioning of visuals until I had a solution for this. If you have an API key added to TacO that has commerce access enabled, from now on the overlay will check every couple minutes if a new sell or buy order of yours has been fulfilled, and will notify you with an additional animated flair around the TP icon's red marker. Clicking the icon (and thereby opening the TP) will make the flair disappear. The point of this is to fix one of the first features I was missing from GW2 when I started playing it: the fact that if you're out and about in the game but are waiting for stuff to sell, you need to keep opening the TP window to know if something happened since you last checked. You can also notice that the TacO icon on the menu has changed. The overlay underwent a bit of a facelift, I updated the icon and made it behave more like the rest of the GW2 menu. The fonts have also been changed to use the exact ones the client uses, for each interface size setting. Oh and last, but not least, the text renderer now supports UTF-8 text, so the TS3 overlay should work better now with non-latin characters in names. Added extra notification flair to the trading post icon that disappears when the trading post icon is clicked (and shows up again a couple minutes after a new transaction happened) - requires API key with Commerce enabled.